BROADWAY NEW YORK - The upcoming Tony Awards mark the end of the 2017-2018 theater season, but that doesn’t mean there isn’t a fresh slate of exciting new plays and musicals just around the corner. With temperatures rising and many getting ready for vacations of all sorts, New York City is gearing up for a fun and full summer of theatre. Here are some of the great shows we can look forward to over the next few months. Previews July 19. Opens August 13. Mitch Papadopoulos always dreamed about being the next Bon Jovi, but he chose security over stardom and left those daydreams behind for a day job. For a while he thought he had everything – the high paying job, the high-rise apartment – until his 40th birthday when he got handed a pink slip and had to move back in with his mom in Sayreville, New Jersey. And when his high school arch nemesis threatens to foreclose on their house, this big-shot banker must save his small-town home the only way he can… by winning The Battle of the Bands. So he dusts off his guitar, gathers his old gang, and sets out to win the battle… and maybe even win back the high school sweetheart he left behind… proving it’s never too late to give your dreams one last shot. The production has music and lyrics by Mark Allen and a book by Ken Davenport and The Grundleshotz with additional material by Sarah Saltzberg, direction by Tony Award winner John Rando and choreography by Chris Bailey, Gettin’ The Band Back Together will begin preview performances on July 19 at the Belasco Theatre (111 W 44th Street) with the official opening set for August13. Previews June 12. Opens June 20. They met at an airport and fell for each other. But in time, they would meet their fate as it all falls apart. A pulse-pounding new play from Tony Award-winning playwright Dennis Kelly and directed by Olivier Award winner Lyndsey Turner takes you on a journey that is at once hilarious, gripping and heartbreaking. 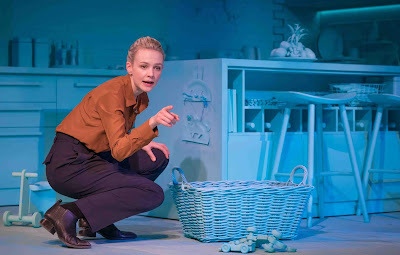 Don’t miss this one-woman masterpiece starring BAFTA Award winner and Academy & Tony Award nominee Carey Mulligan. Audible will also record and release Carey Mulligan’s performance as an audio play, extending its reach to millions of listeners around the world. Produced by Audible, Inc., Girls & Boys will begin performances Tuesday, June 12 ahead of an official Wednesday, June 20 opening night at the Minetta Lane Theatre (18 Minetta Lane, between MacDougal & 6th Avenue – one block south of W. 3rd Street). Previews June 23. Opens July 26. Head Over Heels is the hilarious new musical comedy set to the iconic music of The Go-Go’s, the most successful female rock band of all time. In the kingdom of Arcadia, the “beat” is divine. But when an oracle’s prophecy of doom threatens the Royal Family’s beloved beat, it propels them through a journey of mistaken identities, jealous lovers, secret rendezvouses and sexual awakening – where everything (and everyone) is not what it seems. From the visionaries that rocked Broadway with Hedwig and the Angry Inch, Next To Normal, American Idiot, Spring Awakening and Avenue Q, Head Over Heels will officially open on Broadway at Hudson Theatre (141 West 44th Street) on Thursday, July 26, 2018 (performances begin Saturday, June 23). Previews July 6. Opening July 22. The GRAMMY Award winning and Tony Award® nominated smash broke records, becoming the longest running revue to play on Broadway and was followed by nationwide and international tours. The musical celebrates the songs of the legendary song writing duo, Jerry Leiber and Mike Stoller, which provided hit after hit for icons like Elvis Presley, Ben E. King, The Coasters, and The Drifters. Featuring a wide-ranging catalog, from joyous anthems (“Saved”) to comedic romps (“Charlie Brown”) to songs of yearning (“I Who Have Nothing”), the storytelling aspect of Lieber and Stoller’s songwriting paired perfectly with the theatrical medium. Now, this classic show returns to NYC to thrill a new generation of theatergoers with its enduring themes and searing emotions, directed and choreographed by Joshua Bergasse. Preview performances will begin at New York’s Stage 42 (422 West 42nd Street) on July 6 and opening night is set for July 22. Previews June 5. Opening June 19. On a plantation during the Civil War, a mystical tree stretches toward heaven. It protects James, a young slave, while he reads newspapers about the imminent possibility of freedom, as the battle rages on. When a brooding stranger arrives, James and his makeshift family take the man in. Soon, an unexpected bond leads to a striking romance, and everyone is in uncharted territory. But is love powerful enough to set your true self free? This lyrical and lushly realized play is part of poet, filmmaker and playwright Donja R. Love's exploration of queer love at pivotal moments in Black history. Sugar in Our Wounds, directed by Saheem Ali (Twelfth Night for the Public Theater’s Mobile Unit), will begin previews Tuesday, June 5, 2018 ahead of a Tuesday, June 19, 2018 opening night at The Studio at Stage II – Harold and Mimi Steinberg New Play Series at New York City Center – Stage II (131 West 55th Street). Previews June 29. Opening July 14. A new musical by Stephen Trask (Hedwig and the Angry Inch) and Peter Yanowitz (Morningwood, The Wallflowers, Angry Inch) set against the grit, the garbage strikes and the graffiti of 1979 New York City, This Ain’t No Disco tells the story of drifters and dreamers searching for their place in the night world of Studio 54 and Mudd Club. In their uptown / downtown quest for revelry and kinship, every decision is fateful in a city where one’s luck can turn on a dime bag. Featuring a book by Trask, Yanowitz and Rick Elice (Jersey Boys, Peter and the Starcatcher), direction by Darko Tresnjak (A Gentleman’s Guide to Love and Murder, Anastasia), and choreography by Camille A. Brown (Once On This Island), This Ain’t No Disco will open Tuesday, July 24th with preview performances beginning Friday, June 29th. The production will play through Sunday, August 12th, 2018 Off-Broadway at the Linda Gross Theater (336 West 20th Street).